April 11, 2017 -- Dalet announced today that it has released a new version of its Dalet Xtend plugin for Adobe® Premiere® Pro CC. Dalet Xtend connects Adobe Premiere Pro CC users to the Dalet Galaxy Media Asset Management (MAM) and Orchestration platform, providing a direct gateway to metadata-rich assets and facilitating collaboration with users such as journalists, prep editors, sports producers and other production personnel on the Dalet Galaxy platform. The new HTML-5 Dalet Xtend panel for Adobe Premiere Pro CC adds support for multi-sequence export, locator inheritance, configurable metadata forms for exporting content, and support for the ‘while’ scenarios when exporting from Adobe Premiere Pro. 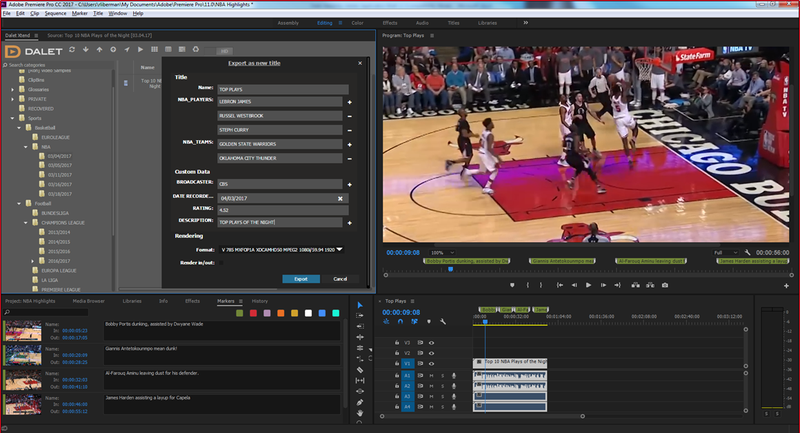 By connecting via the Dalet Xtend plugin, editors working on Adobe Premiere Pro can import media, including shot selections, sequences and EDLs, made by other users on the Dalet Galaxy platform, as well as previously saved Adobe Premiere Pro Projects and Sequences. Adobe Premiere Pro users have instant access to content in the Dalet Galaxy MAM and edit in place - out of the shared storage - even as material is still being recorded. The plugin also allows the editors to choose to work on proxy, leveraging the smaller file size to work faster and reduce network dependency, then switch to full resolution when needed or for final render of their project. Video packages can be pushed to air as media are still being rendered to the central storage. Editors can directly save against a placeholder within Dalet Galaxy, an ideal feature for fast turnaround workflows like news. Bidirectional metadata exchange and genealogy ensure all useful data are passed on to Adobe Premiere Pro, retained throughout the editing process and exported back to Dalet Galaxy for consistency. The exchange is configurable and can include information such as manual annotations, closed captions extracted from video, report data from media analysis engines (like QC), censorship markers, digital rights, etc. Dalet will be showcasing the new version of Dalet Xtend for Adobe Premiere Pro CC at NAB 2017 on booth SL6210. For more information, please visit www.dalet.com.